A beautiful bedroom is a place in your home that is both welcoming and relaxing. Your bedroom is your own private oasis. It is the perfect space to rest your weary head after a long and stressful day. But how do you transform a lackluster bedroom into a stylish and restful retreat? With so many styles, colors, and furniture options, trying to get that perfect look can be quite overwhelming! In this guide, we'll answer a few basic questions and help you create the master, guest or kids' bedroom of your dreams. Remember, if you have any questions at all about the information below, feel free to call us at (212) 518-2752 and speak to one of our trained service specialists. Or if you prefer the convenience of email, drop us a line at [email protected]. What style of bedroom furniture should I choose? Take a look at the other rooms in your home. You can choose to make the decor in your bedroom similar in style in order to create a cohesive and unified look throughout your house. Or you can have different styles in different rooms, or even mix pieces of different styles in the bedroom. Is your other furniture traditional, modern, contemporary, eclectic, country, or casual? If you are still not sure, look at some of your favorite things - a painting, a vase, or even a favorite piece of clothing. These will give you hints as to what your decorating style is. For bedroom furniture, you'll want to incorporate your design with some calming elements that may include color, patterns, or lighting to help create a restful and serene atmosphere. Some people prefer contemporary furniture in their living room and dining room while having something more traditional in the bedroom. Others prefer the opposite. There's no wrong answer here, it depends on your personal preferences. How much should I plan to spend on bedroom furniture? Determine your furniture budget before you start shopping. No matter your furniture style or the size of the bedroom you are trying to furnish, here you will find great values on a huge selection of bedroom furniture whether you are looking for an entire bedroom suite that includes a bed, nightstands, dresser, mirror, chest, and TV armoire, or just a few key pieces to update your master or guest bedroom or the bedroom of your child. What are the different types of furniture materials? Bedroom furniture can be made from a variety of materials. This is important because the type of material is a factor in determining the quality of the furniture piece and the price you may pay. Bedroom furniture can be made from a myriad of materials, including solid wood with wood veneers, particle board, medium density fiberboard (MDF), metal, marble, leather, faux marble and by-cast leather. Furniture made from solid wood and wood veneers is generally strong, durable, and beautiful. Solid wood can be carved to add exquisite details and design elements directly onto the furniture. Plus, wood can be finished in a variety of colors that can naturally enhance the beautiful grain and textures of the furniture. Engineered wood, such as MDF and particleboard, is made from multiple wood fibers that are glued together under heat and pressure. What are the different types of wood from which bedroom furniture can be made? The different types of wood from which bedroom furniture is made include oak, cherry, maple, pine, birch, mahogany, and asian hardwood (a.k.a. 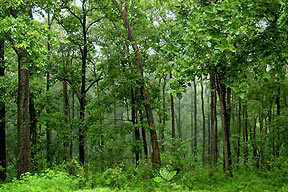 rubberwood - see picture above). While the majority of the wood on this list may sound familiar, fewer people have heard of rubberwood. Rubberwood is a member of the maple family and originated in South America and was transported to Asia. It is durable, strong, and is considered one of the most environmentally friendly hardwoods used in today's furniture industry. Regardless of the type of wood or wood veneers the furniture is made of, the wood can be colored or stained to be another color. For example, a bed made out of oak can be stained cherry so it will look just like cherry and be a fraction of the price of an actual cherry wood bed. What material makes the best quality furniture? Solid wood furniture is considered the best quality furniture on the market. It can also be the most expensive. If you are purchasing furniture that will be in your home for a long time, it is a very smart investment. Even with wear, solid wood gains character and charm and becomes a part of your family. Solid wood furniture is usually crafted with extra attention to detail that includes dovetailed joints, wood on wood drawer glides, and strong protective finishes. No two pieces of solid wood furniture are the same, so your furniture will be completely unique. How much time are you willing to spend to keep your bedroom furniture looking good? Different materials require different care. Wood bedroom furniture is usually easier to clean and polish than some other common furniture materials like particleboard, fiberboard, powder-coated steel or brass. One of the best products to use to clean and polish wood furniture is Pledge. Also, consider how often you will be moving the bed. If you plan on moving your furniture a few times, get something that can be easily disassembled and moved. A lot of MDF and particleboard beds are not designed to be disassembled and moved. Do I have to assemble bedroom furniture myself? It is difficult to fit most beds into a delivery truck when they are fully assembled. This is why some assembly is usually required. Home assembly is included in our white glove delivery service and for a limited time, we are offering white glove delivery and assembly service for free. Check here to see if you qualify. If you don’t qualify for free white glove delivery, you can choose to purchase assembly from us or you can assemble the furniture yourself. Although furniture assembly usually requires no real technical know-how having a few tools like a power drill and a screwdriver is helpful. What is the right bed size for me? Many factors affect the size of bed you'll need. First and foremost, you need to take into consideration the size of the person or people who will sleep in it. King beds (California and Eastern) are the largest, followed by queen beds, full beds and twin beds. The dimensions of each size are as follows. Note that full size beds are only 6 inches narrower than queen size beds. The other factor to consider when deciding what size bed to purchase is the size of the room. You need to have some space to walk around the bed, access your closet and dresser, change the sheets, etc. In a small bedroom, a full size bed would probably fit better and make the room look bigger than a king size bed would. For example, in a 10’ x 10’ room, the most you can usually fit is a queen size bed, a small dresser, mirror, chest and 2 nightstands. It is a good idea to measure your room carefully before buying furniture and take a look at the dimensions of the pieces you are buying. How do I maximize space in a small bedroom? If your bedroom is small, consider getting a full or a twin size bed. In a smaller room or a guest room, a popular choice is to put a queen size bed, a dresser, a mirror and one nightstand. Also, here at BedroomFurnitureDiscounts we have grown-up looking twin beds that are perfect for a smaller room. You can also consider a loft bed, which will give you maximum space in your room. What is the right bed type for me? When shopping for a bed, first make s ure it works with the mattress you have if you are using your existing mattress set. For example, if you are buying a platform bed or another kind of low profile bed, a thick pillow top mattress may not be the best choice. Consider getting a new mattress at the same time as buying a new bed. Most mattresses are made to be at their peak for 6 years. To get the maximum life from your mattress you need to rotate it every 6 months and flip it over every year. If your mattress is a pillow top on one side only, don’t flip it over. When shopping, think about how the bed will look with your other bedroom furniture and decorations. Some people like all of their bedroom furniture pieces to match, while others prefer to mix and match different styles and colors. If you want something modern, consider a platform bed or a panel bed. If you want something more romantic and whimsical, consider a canopy bed, a poster bed, or a metal bed. 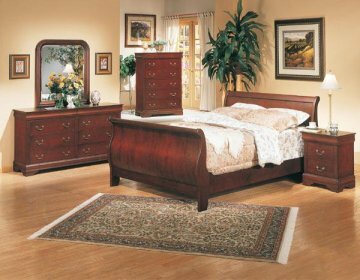 Cherry sleigh beds are the most popular types of beds in the United States. Another way to spruce up the look of your bedroom without breaking your wallet is to buy a new bed and add a few new accessories, such as pillows or an accent lamp, chair, or rug. A few small changes can make a dramatic impact. Also consider what you do in bed besides sleeping. If you like reading in bed then a sleigh bed would be perfect for you since sleigh beds usually have a slight recline angle on the headboard. If you are looking for extra storage, consider getting storage bed. This type of bed usually has drawers underneath the bed that give you extra storage for shoes, clothes and linens. If you are shopping for a child in your home, consider a youth bed, bunk bed, or trundle bed. Youth beds come in smaller sizes with playful designs and colors that your kids will love. Bunk beds are fun and nostalgic; who didn't love sleeping on the top bunk when they were a kid? And trundle beds provide the extra space needed for sleepovers and slumber parties. What are the pieces that make up a bed? A bed usually has a tall headboard on one end and a short footboard on the other end. In the middle are the frame and the rails on which the mattress sits. Some beds have more than this, and some have less. What you need will depend on your bedroom's decor and your comfort needs. For example, tall people might want to avoid a bed with a footboard, as it might make it difficult to stretch out. If you are very tall and you really want a footboard, get a sleigh bed that curves out away from the top of the mattress. What are the different types of nightstands? There are nightstands with drawers, with doors, a combination of both, or with open shelves. It's all a matter of what you want. Just make sure you pay attention to the height of the bed side table. It needs to be tall enough that you can see and reach the alarm clock, lamp, or your cell phone from bed. Some nightstands are short and designed to sit beside platform beds. Others are tall and better suited for a traditional bed with a box spring mattress. Ideally, you want the top of your night table to be around the same height as the top of your mattress. Some nightstands even have hidden felt lined jewelry drawers that are helpful for storing and protecting jewelry, watches, glasses and other small items. What is the difference between dressers and chests? Chests and dressers are almost synonymous. Both are used for storing clothing, accessories, and bed linens, however they are shaped differently. Dressers are usually wider than they are tall. Chests are vertical and feature a single column of drawers stacked on top of each other. Some chests are designated as lingerie or jewelry chests, meaning they are narrower and smaller, perfect for storing their namesake. Measure carefully, so you'll know exactly how much space you have for your dresser or chest to occupy. Look closely at the dimensions of each dresser or chest you are considering to ensure it will fit through the door, around the bed, and in with the rest of the furniture. For example, it may be difficult to fit both a dresser and a chest into a 9’ x 10’ room where you already have a queen size bed and 2 nightstands. How do I find the right dresser or chest for my bedroom? It's all in the drawers -- how many and how large they are. Basically, the bigger the better when it comes to dressers. If you're short on drawer space, you're stuffing the clothes in the drawers and forcing them shut. With more space in the drawers, you can avoid wrinkles in your clothes while allowing more air circulation. What is an armoire and do I need one? An armoire, also known as a wardrobe, can make a beautiful addition to a bedroom, even if the room already has a large closet. There are many different armoire configurations. The most common and basic configuration features a clothing rod behind double doors, along with a couple of drawers at the base. There are other, more complex types of armoires too. For example, you can get what's known as an "entertainment cabinet" or "TV armoire," which has a storage and display space for a TV and stereo concealed behind cabinet doors. The versatility and functionality of the armoire makes it a great furniture piece for other rooms in the home, too. It can be used in the den, media room, or any other room where extra storage is needed. Armoires take up a lot of space, relatively speaking. Make sure you get one that isn't too big for the bedroom. You also might want to measure the door and make sure the dimensions of the armoire will allow for moving it in and out of the room. If you have a few kids in the house and find yourself a little short on space, you might want to consider a trundle bed, a rolling bed that collapses to be stored underneath a regular stationary bed. It gives the kids a little more room to play during the day. Plus, a trundle bed also serves as an extra place that can be used for sleepover guests. Daybeds are combination couches and beds. They have a board or frame that wraps around three sides of the bed, much like a couch. You can line the back and sides with pillows to make it a comfortable place to sit during the day, and then at night you can remove the pillows for a relaxing place to sleep. Daybeds are different from futons, as daybeds do not fold down flat and use a traditional mattress. Loftbeds are the perfect solution for small rooms such as dorm rooms or youth bedrooms that need to make the most of the space. Loftbeds have an elevated bed on top similar to a bunk bed along with a desk and storage space on the bottom level. This creates a multi-functional room perfect for sleep, storage, and study. By-cast leather can be a top grain or split hide leather that is is ironed very smooth to remove most of the natural graining and folds of leather. Then, a large amount of protective coating is applied. This type of leather is usually used on more contemporary bedroom furniture. The advantage of this kind of leather is that it is very easy to clean. Do you have a question that we haven’t answered here? If you have a question that we haven't answered here, feel free to give us a call at (212) 518-2752. The knowledgeable staff at BedroomFurnitureDiscounts.com is always happy to help!